I finally made this very famous Wu Pao Chun Champion toast (吴宝春金牌土司) on the very same day that I made my rice cooker chicken wings. What is special about this loaf bread is that it requires no dough starters unlike Alex Goh's sweet bread dough or the Hokkaido Milk Loaf, yet the bread has a very soft and fluffy texture even on the 2nd day. Also there are no eggs involved, so it is very suitable for vegetarians/vegans! For some reason, my bread didn't turn out very nicely on the surface and the rising was not optimum. My result was not too good, I need to try it out again. I am not sure why one roll decided to break into a "smile", like a french loaf. It was very hot and humid here in Belgium during the 1st proofing, in fact I noticed drops of condensation under the clingwrap, but shortly after, the sun decided to play hide-and-seek with me. 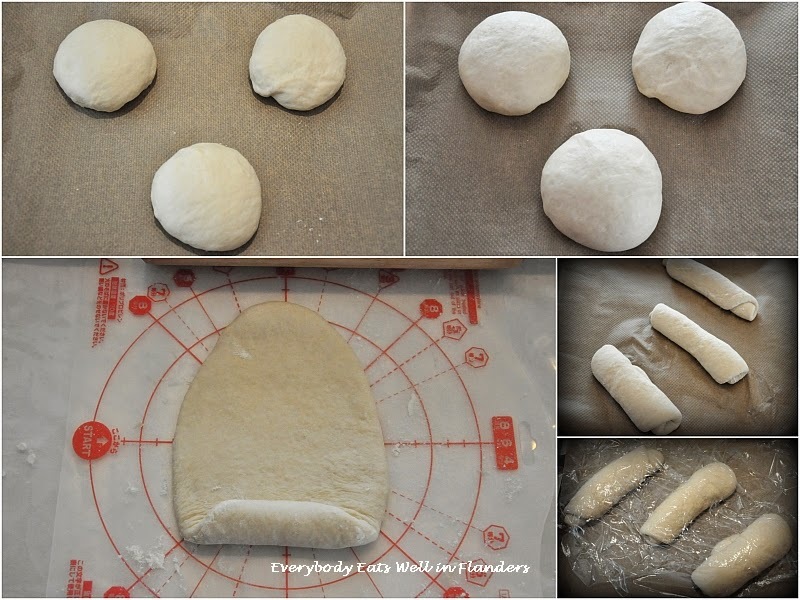 The sky quickly became overcast and as it threatened to rain, I quickly brought my dough indoors to proof. But our room temperature was only 20 degrees celsius and I didn't wait for it to double in volume, I just proofed for 50 min for the 2nd proofing. The dough did not rise high enough, but the texture was really good, just exactly what the other bloggers raved about. I did not slice the loaf bread until the next day, and being the "kiasu" Singaporean, I wrapped it in 2 layers of clingwrap and sealed it in a plastic bag. It was still soft and fluffy the next day, since the loaf was not big, I finished it for breakfast and lunch all by myself!!! Btw, this bread is called the Wu Pao Chun Champion Toast (吴宝春金牌土司) based on the famous taiwanese baker Wu Pao Chun, and this recipe has been circulating non-stop in the chinese blogosphere for the last few months. This is really a very good white bread recipe, and since my bread turned out to be pretty short and ugly, I am definitely gonna try again next week with the same recipe but maybe using a different bread tin or maybe baking it directly in my bread machine, to see if it makes a difference. ** Note that you have to be very precise about the amount of liquid, it should range from 196g to 200g. Pls use a measuring scale and do not use measuring cups. 1. Place all ingredients (except butter) into the bread machine or stand-mixer and mix with low speed, followed by medium speed to knead it into a shiny and smooth ball. 3. Shape it into a ball with the smooth side facing up, cover with greased cling wrap and leave it to proof in a draught-free place for about 1 h or until doubled in size. 6. 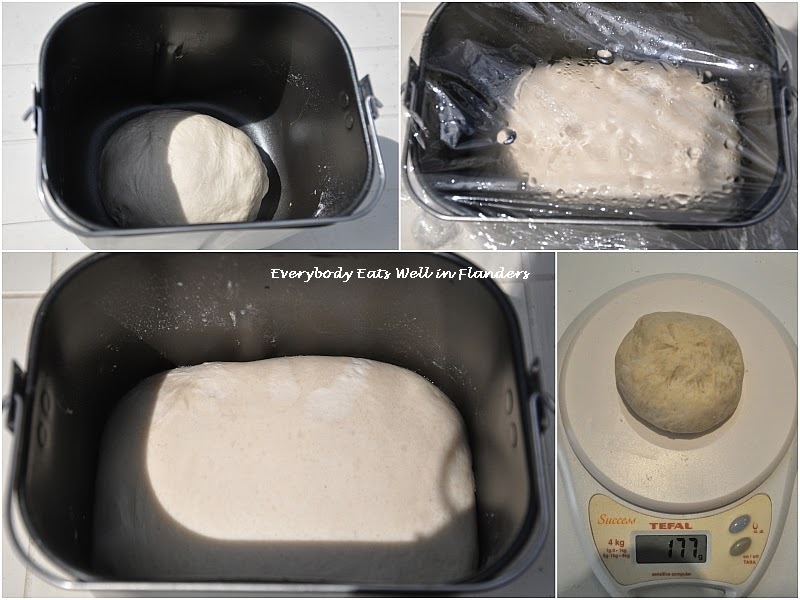 Place the 3 pieces of dough into a 400g Pullman bread tin. Cover with greased clingwrap and leave it to proof in a draught-free place for about 50-60 min. Bee, this WPC loaf recipe is definitely a keeper. 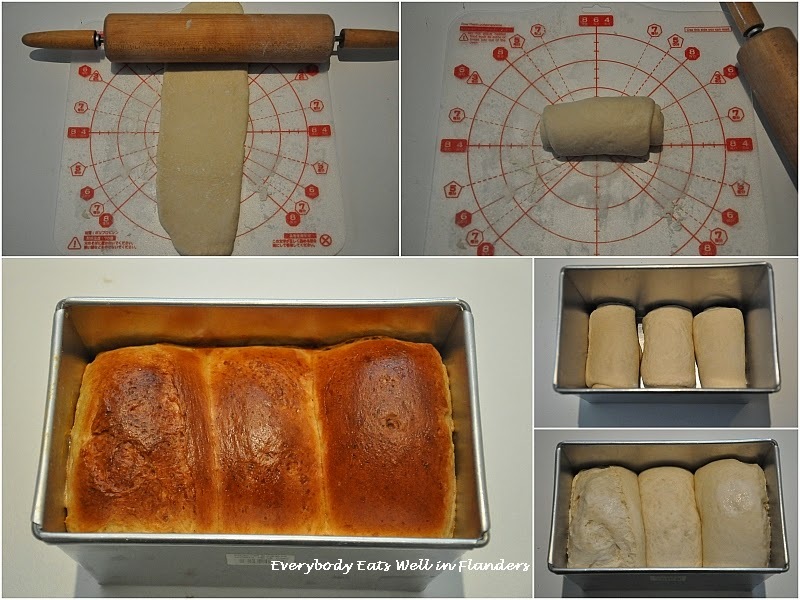 I have tried both breadmaker and pullman tin methods and yield different results, prefer the pullman tin loaf as the bread is so soft like Ya Kun's one! Yes, agree that this bread is very soft and fluffy, a pity that my bread didn't rise high enough, will try again. So the bread machine version didn't work well? Thanks for letting me know. I was thinking of which mode to use - white bread or sweet bread mode? Hi,Bee...you have also make this famous loaf! You may also share this to LTU, I think this is one of the famous link in this month's LTU!